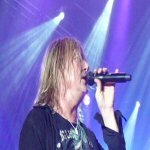 Def Leppard singer Joe Elliott has been interviewed by Las Vegas Review Journal about the VIVA Hysteria! residency in Las Vegas. The VIVA Hysteria! residency starts tonight (check back later for a Live Blog) and Joe has given yet more details of the setlist. Joe mentioned once more that the band will be digging out rare songs (word from last night's soundcheck suggests they are indeed doing just that!). He also talked about the making of the album and playing of the three rarer songs. "We're pulling out some majorly obscure stuff," Elliott says. "I can almost guarantee that whoever reviews the first night is going to have go on to YouTube and figure out what the hell we just played." "With three band members living in L.A. and two in Dublin, Ireland, it’s a challenge for them to collaborate on new material, which they plan to do while in town."